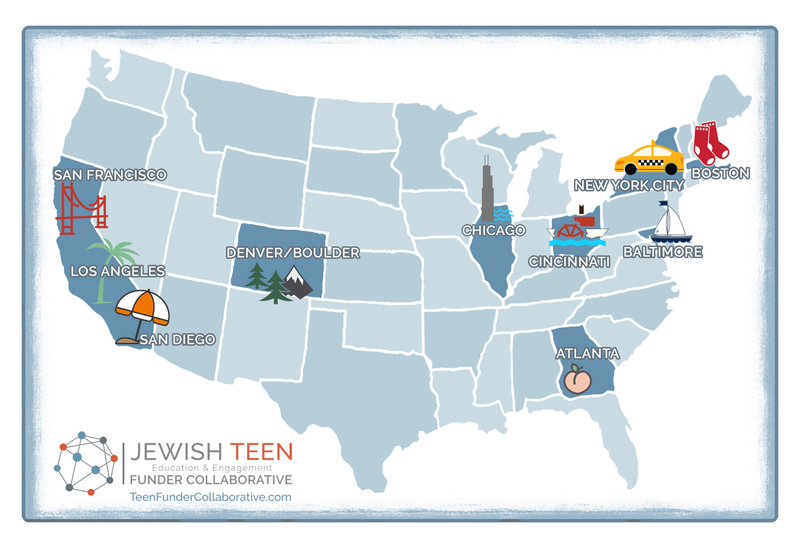 In 2013, Jim Joseph Foundation convened more than a dozen local and national funders of Jewish teen programming for a series of discussions on expanding teen involvement in Jewish life. The funders learned together and commissioned groundbreaking research—and ultimately began to design responsive local teen engagement initiatives in communities across the country. This group evolved into a robust, collaborative community: The Jewish Teen Education & Engagement Funder Collaborative. This innovative learning and sharing network has created an environment that fosters risk-taking, experimentation and ongoing reflection. Funders serve as resources and thought-partners to their practitioner colleagues who are at different points in the process of launching, growing and refining their initiatives. Members share a commitment to transparency, with the goal of increasing knowledge and contributing tools to help advance the entire Jewish teen engagement field. The Funder Collaborative also shares its internal process and findings with others who may choose to embark on their own co-funding endeavor. Download our latest brochure with information about the Collaborative, our communities, and how we measure success. For more details about our structure and participating organizations, please visit the FAQs. The insights our research generates is reshaping the national conversation and influencing the practice of Jewish teen education and engagement. We are uncovering valuable information about the desires, beliefs and motivations of Jewish teens, and discovering and refining the most promising engagement practices. Our initiatives signify a shift in traditional Jewish programming and offer diverse new ways to reach, educate, engage and inspire unengaged teens. Initiatives draw on the strength of partners and respond to the needs and desires of local teens. We invest heavily in two concurrent evaluation efforts to create shared frameworks and universal tools so we may analyze outcomes across communities. Evaluative efforts allow us to understand our process and outcomes; all of our findings are published to benefit the field of teen engagement. The collaborative is comprised of ten communities of varying sizes and demographic composition. Each has embarked on responsive teen initiatives informed by rich, ongoing conversation with community stakeholders, local organizations, collaborative colleagues and teens. What is the mission of the Funder Collaborative? We are an unprecedented endeavor in which local and national funders collaborate in the work of education, relationship-building and co-investment in multi-faceted local Jewish teen education and engagement initiatives. We believe the work of the Funder Collaborative, and the teen initiatives underway in each of the communities, can actively build the field of Jewish teen engagement. We strive to improve the existing landscape by driving deep change in local communities to catalyze broader impact. Through the work of the Funder Collaborative and participating communities, new programs are being incubated, existing program providers are being incentivized to expand or deepen their work, youth professionals are receiving serious professional development – and all are taking evaluation seriously. It is part of our mission to share all that we learn so that others may bring successful strategies to scale. Who are the professionals that make up the Funder Collaborative? Sara Allen is the Director of the Jewish Teen Education and Engagement Funder Collaborative. She is the first full-time Director is works in consultation with an Operating Committee and Evaluation Advisory Group drawn from participating communities. Sara has nearly two decades of experience in both the private sector and Jewish organizational worlds, with expertise in strategic planning, marketing and development, millennial engagement and leadership development, and new technology. Most recently, she was Senior Vice President at The Jewish Federation of Greater Los Angeles, where, among other responsibilities, she led the multi-million dollar NuRoots engagement initiative. She welcomes you to be in touch at sara@teenfundercollaborative.com. Which organizations participate in the Funder Collaborative? More details on our structure here. How were the participating communities selected? The Jim Joseph Foundation sought out local funding partners who share a desire to invest in new experiments to reach substantially more Jewish teens. Communities were selected for their willingness to engage in community-wide programming, experience developing strong partnerships – locally and nationally – with Jewish teen education organizations, capacity to fundraise for the matching grant, and interest in the teen audience. Local or national organizations, or lay leaders, seeking more information or interested in exploring programmatic partnership with a local community may contact Funder Collaborative Director Sara Allen at sara@teenfundercollaborative.com. Can my city/ organization receive funding for teen programs through the Funder Collaborative? The ten communities reflect the full membership of the Funder Collaborative, and neither we nor Jim Joseph Foundation are accepting requests for funding. Local or national organizations interested in exploring programmatic partnership with a local community may contact Director Sara Allen at sara@teenfundercollaborative.com. Who are the evaluators working with the Funder Collaborative? Rosov Consulting is responsible for the Cross-Community Evaluation, aggregating and analyzing data from the participating communities. Additionally, they serve as local evaluators for several of the communities. Informing Change is also retained as local evaluators for several local communities.